Originally released on the PlayStation 2 back in 2001, Capcom has splashed a new coat of paint on the original Onimusha. While I would have preferred to have seen a remaster of the superior version that released a year later on the original Xbox, it is still an absolute delight to revisit one of Capcom’s greatest, and yet lesser known, franchises. While the remaster does overhaul the visuals to provide cleaner textures to its 3D elements, it also highlights the dated pre-rendered backdrops that make up each and every environment. While the gameplay has held up rather well after nearly two decades, its visuals are sadly another story. The type of remaster here is one I often remark as the type that reminds me of what I remember the original looking like way back when, before we were then spoiled with high resolution textures and the various modern advances of technology. While I know full well that the game didn’t look this good some 17’ish years ago, this is the type of remaster that puts me back to my first time with the game, if that makes any sense. While I hope we see a modern take on the franchise at some point in the near future, revisiting its roots is still a great time to be had. While newcomers to the series may find the game a fair bit awkward to control, given how you navigate its pre-rendered backgrounds, it was a format that was made popular with Resident Evil, a beloved classic and one of most well known gaming franchises of all time. Thankfully, this new release allows the use of the analog sticks, an option that wasn’t present the first time around. While this style of game is designed around what has been referred to as “tank controls”, having the analog sticks function as you would want them to makes a world of difference and in some ways makes the game feel new again. Where Capcom’s zombie franchise was originally meant to be a more slower paced experience, before it turned into an all-out action shooter, Onimusha is a more action-focused adventure due to its setting and combat-orientated opponents. Taking place in a demon-infested feudal setting, Onimusha has a wonderful aesthetic that is complimented by its superb art direction and straight-forward narrative. Onimusha has one simple goal from the onset; save the Princess. While there are numerous complications that occur through the 4 to 5 hour experience, the story consistently remains this simple. You play as a Samurai named Samanosuke Akechi, based upon the actor, Takeshi Kaneshiro. After failing to save Princess Yuki during an encounter with a powerful demon, Samanosuke is granted the Oni Gauntlet by the council of the Twelve Oni Gods. The Gauntlet allows Samanosuke to absorb the souls of his foes and use them to either enhance his weapons, power his special attacks, or gain back lost health, all depending on the color of souls you absorb. As Samanosuke, you will vanquish a variety of demons with a small assortment of weaponry. You’ll have access to three main melee weapons, each with their own magical attack, with a fourth unlocked pretty much near the end of the game. Apart from that, you will have a bow and a muzzle-loaded firearm called the Matchlock. While the swords are extremely fun and quick to use, it is the ranged weapons that leave a lot to be desired due to their sluggish nature and the inability to swap weapons while moving. Nearly everytime I opted to swap to the bow or the rifle, the enemy would close the gap far too quickly, or a stray arrow would come out of nowhere before I could even fire off a shot. Had the remaster adjusted for weapon swapping to occur during movement, then I would have a very night and day difference in my opinion here. As you slash and stab your way to save Princess Yuki, Samanosuke will earn red souls that can be used to power up his weapons and special orbs that are used to break seals on certain doors. Each weapon and orb has a maximum ceiling of level three and should you grind out some enemies from time to time, you can easily max everything out before the end credits. During combat, these souls can fade away should you not absorb them quick enough. There is also an enemy type called the Gyaran that will attempt to steal those souls away from you should you be too slow to attack them. Samanosuke is joined by Kaede, a female ninja that is playable during a few segments of the game. While she is weaker due to not wielding the Oni Gauntlet and the perks that come with it, she has the ability to throw out fast daggers and pick the locks of certain doors, locations that Samanosuke must find alternative routes to access. Eventually you will find a special dagger that will increase her odds of survival, but you’ll mostly want to run and avoid the larger enemies as her weaker attacks can take forever to defeat some of the more imposing threats. Both Samanosuke and Kaede will have various puzzles to contend with that range from sliding blocks around to form a symbol, moving across a trap-filled floor, or shuffling numbers around to unlock a variety of chests. The puzzles are not terribly hard, but several of those chests contain permanent upgrades to your vitality as well as story crucial weapons and items. While the puzzles can feel somewhat out of place here, they were very common place back when Onimusha first released back in 2001. Onimusha doesn’t stray too far from the original Resident Evil formula as you’ll have to collect items to unlock doors, use herbs as a healing device, and backtrack to locations time and time again. 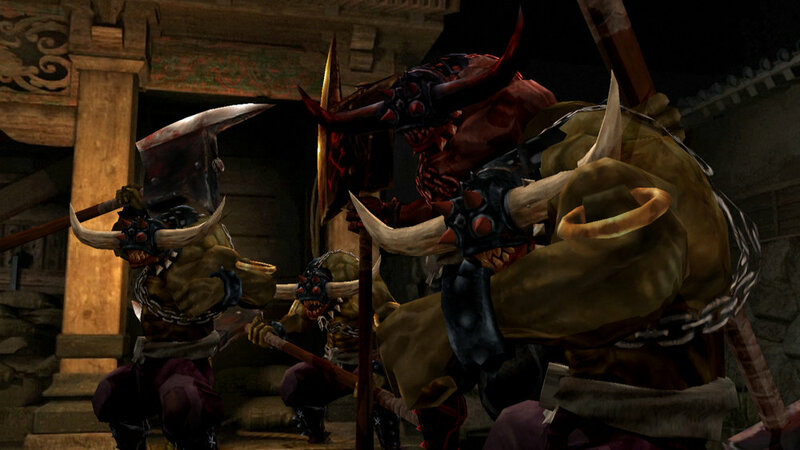 Onimusha also uses the same style of pre-rendered backgrounds that were made popular with the original Resident Evil games. At the time, full 3D backgrounds were a challenge to develop due to the limited tech available. These static backgrounds looked incredible on older TV’s at the time and since these environments often looked better than anything produced using polygons and textures. they were often some of the best looking games available. Where this remaster fails is in making those pre-rendered assets look good as the increased resolution of both the game and your TV will showcase how dated these backgrounds are. When the game kicks into a cutscene, you are often shown these backdrops up close and they are often pixelated and grainy. While it would certainly have taken a great deal more development time, it’s a shame that character models, textures, and backgrounds weren’t completely rebuilt from the ground up to at least modernize the game visually. With how often Capcom has remade Resident Evil with all new assets, it would have been great to see Onimusha get a similar treatment. While the English voice acting is still as bad as it was, the Japanese voice track has been completely re-recorded, with Takeshi Kaneshiro even coming back to voice Samanosuke. The game’s orchestral soundtrack was also re-recorded as well. As the original was developed for 4:3 ratio televisions, Capcom has converted the game to the now modern 16:9 ratio thanks to some panning and zooming techniques to allow for the ratio change. It is a system that works extremely well and one I hadn’t even noticed until I remembered halfway through the game that yeah, 4:3 was a thing back then. While Onimusha is a much shorter game that I remember, I really enjoyed jumping back into it. While I am sure that Capcom is holding a modern sequel or a more substantial remake hostage with how well this remaster sells, I’m still appreciative that Capcom has chosen to release this game to a whole new generation of gamers. While its combat is still incredibly satisfying, the game has a small measure of trouble holding up visually. With costumes and weapons to unlock, as well as a challenging tower mode to complete, Onimusha has a decent amount of content to push through with its low budget price. Onimusha: Warlords was purchased by the reviewer.